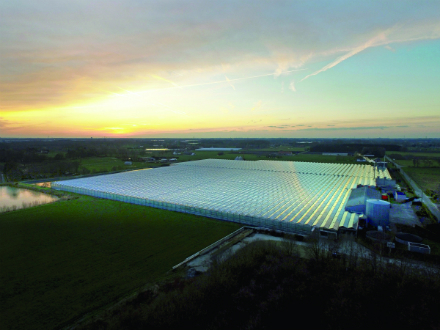 Rolls-Royce has won a contract to supply a 7 MWe combined heat and power plant to a new tomato greenhouse in Belgium. The plant, scheduled to go into operation early November 2018, will employ two gas-fired gensets based on the new medium-speed Bergen B36:45L6 engine. The contract, with Tuinbouwbedrijf Marc Pittoors (TBMP) BVBA, also includes a ten-year service agreement. Marc Pittoors will use the generated electricity to power the greenhouse artificial lighting and heat extracted from exhaust gases and engine cooling systems to heat up the facility. In addition, cleaned engine exhaust gases will be injected into the greenhouse to increase the level of CO2 and boost plant growth. Paul Hovius of PaCHov Consultancy conducted the sales and contract negotiations for this first CHP plant equipped with the new Bergen in-line engine. Rolls-Royce will be supplying the complete CHP plant for this greenhouse, consisting of the generating sets, the exhaust gas systems, including selective catalytic reduction equipment and heat exchangers, and the electronic control system. Overall, the CHP facility achieves efficiency levels over 96%. Rolls-Royce has since 2005 delivered 52 CHP plants with a total installed capacity of 270 MWe to greenhouses in Holland, Belgium, Russia and the UK.